closed off most of the overland routes and subjected the spices to heavy taxes. country at the gateway between the Atlantic and the Mediterranean. history was as the standard-bearers of Christianity against the Muslims. 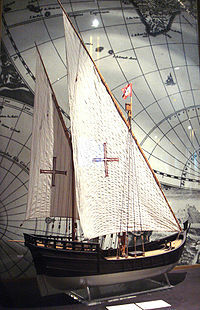 Portuguese Caravel, This was the standard model used by the Portuguese in their voyages of exploration. It could accommodate about 20 sailors. Due to its lighter weight and thus higher speed, the caravel was a boon to sailors. not go on them himself. Gambia River, and Cape Palma. defeat the Muslims, to spread Christianity, and to establish trade routes. decision to split the new world between them and Spain. All they accumulated was what is today’s Brazil. However they became very profitable using the slave trade in Africa. the Atlantic Ocean, and Indian Ocean. personal union of the two countries' crowns. · "Amerigo Vespucci". Catholic Encyclopædia (New Advent). http://www.newadvent.org/cathen/15384b.htm. Retrieved 22 June 2010. · "Ancient Silk Road Travelers". Silk Road Foundation. http://www.silk-road.com/artl/srtravelmain.shtml. Retrieved 14 June 2010. · "By the road of pathfinders". Sbaikal.ru. · "Discovering Francis Drake's California Harbor". Drake Navigators Guild. http://www.drakenavigatorsguild.org/booklet.html. Retrieved 17 June 2010. · "Exploration–Jacque Cartier". The Historica Dominion Institute.